Dolly PartonDolly Parton's Coat of Many Colors was truly a remarkable TV movie! I learned so much about Dolly's upbringing that I didn't know. It was great to see her as a little rascal, but also how she got her down home roots and inspirational sayings. Coat of Many Colors really showed why Dolly is the way she is today! 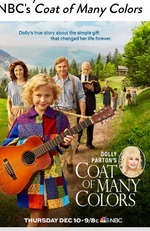 As much as this movie was about Dolly's early life, Coat of Many Colors was more about having faith and love in yourself and some higher power (in Dolly's case it was G-d) as well accepting others for who they are. Dolly's mama really instilled these values in Dolly and it just demonstrates why Dolly is so accepting of everyone. Dolly really endured some rough times growing up, but watching how she handled her adversities has made me re-think how I should handle mine. You see, that is one of the reasons I love Dolly Parton, it's because Dolly always teaches me something, even when I'm just planning to be entertained. Alyvia Alyn Lind as "Dolly Parton" in "Coat of Many Colors", Photo Credit: Quantrell Colbert/NBC Alyvia Alyn Lind as "Dolly Parton" in "Coat of Many Colors", Photo Credit: Quantrell Colbert/NBCNow let me talk about this cast! Alyvia Alyn Lind was incredible as "Dolly!" She was so engaging and what a voice! I hope she comes to Broadway soon so she can really belt it out! The little bit I knew about Dolly as a young girl was just what I've seen through pictures and a few interviews, but what I saw in Alyvia, I felt as though she really captured the essence of Dolly. Jennifer Nettles as "Avie Lee Parton" and Ricky Schroder as "Robert Lee Parton" in "Coat of Many Colors", Photo Credit: Quantrell Colbert/NBC Ricky Schroder as "Robert Lee Parton" and Jennifer Nettles as "Avie Lee Parton" in "Coat of Many Colors", Photo Credit: Quantrell Colbert/NBC Jennifer Nettles was wonderful as Dolly's mother "Avie Lee Parton!" The intense and emotional ride Dolly's mom experienced was brought to life so powerfully by Jennifer! She had great chemistry with Alyvia and Ricky Schroder who portrayed Dolly's dad "Robert Lee Parton." Ricky also gave a powerful performance! From the stories I have heard from Dolly in interviews, it sure seemed like Ricky was spot on with his portrayal of Dolly's dad. Dolly's dad had his own struggles and Ricky brought those struggles to life! Watching Ricky in this role, reminded me of one of my other favorite Ricky Schroder TV movies, To My Daughter with Love where Ricky stole my heart as a single dad raising his 6-year-old daugther. Mary Lane Haskell as "Miss Moody" in "Coat of Many Colors", Photo Credit: Quantrell Colbert/NBC Stella Parton as "Mrs. Corla Bass", Mary Lane Haskell as "Miss Moody", "Gerald McRaney as "Reverend Jake Owens", Alyvia Alyn Lind as "Dolly Parton", Jennifer Nettles as "Avie Lee Parton", and Ricky Schroder as "Robert Lee Parton", Photo Credit: Quantrell Colbert/NBCAnd there was Mary Lane Haskell, who played "Miss Moody," Dolly's school teacher. I have see Mary Lane perform at 54 Below here in NYC in Here She Comes Again: 54 Below Does Dolly Parton, so I was super excited to see her in Coat of Many Colors. Mary Lane was super as "Miss Moody." She effortlessly showed the strictness of school teachers in those days, but she also showed her belief in Dolly and Dolly's dreams. That belief must have meant a lot to Dolly. I know, for me, I have always remembered the teachers who encouraged me to follow my dreams or supported me in some way. I hope this featured part leads Mary Lane to more film/television roles! Dolly Parton in "Coat of Many Colors", Photo Credit: Quantrell Colbert/NBCCoat of Many Colors was so well put together and terrifically cast/directed. I hope there will be another film chronicling Dolly's rise to stardom! If you missed Coat of Many Colors you can watch it at NBC.com through Janaury 5, 2016!